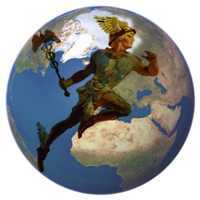 Mercury, the messenger of the gods, symbolises mentality: our intellect and mental outlook, the way we think and communicate. Mercury, as Hermes, is the emblem for the magus, the wise counsellor, divine messenger—and prince of thieves! Planetary lord of Gemini and Virgo, this fast-moving planet stands for ideas, methods and information, especially as expressed through communication and media. Mercury rules writers, travellers, analysts, magicians, salespeople, astrologers and all types of consultants. Long known as the Divine Messenger, Mercury rules all forms of communication, whether via writing, letters, email, media, film or multimedia, and by speaking, on the phone, via the WWW, or in person, whether one-to-one, or by addressing groups. Logic and analysis is his sphere, so he also governs scientific enquiries and research work. Charming and shrewd, Mercury influences writers, astrologers, mathematicians, engineers, dealers, brokers, businessmen and media personalities. Commercial ventures and media organisations are also ruled by Mercury. Through his rulership of our hands, Mercury also reveals our manual dexterity, organisational and mechanical skills, so artists, sculptors and engineers generally have a strong Mercury. The kind of intellect that can produce a great novel can on the dark side generate a master plan for massive financial fraud. An afflicted Mercury can produce deception, trickery and dishonesty, so if you have been conned by the art of hustling (deceptive communication), cattle rustling (crossing borders), or the victim of a pickpocket (tricky fingers), Mercury is behind it! It's interesting that Mercury is also the great healer. As consultant and doctor, he enables the transfer of healing energies between the therapist and the patient. Mercury's staff, the caduceus, symbolically represents the mighty occult forces indicated by two snakes entwining a rod or wand. These snakes have several layers of meaning, but they are principally active energy channels—particularly in tantra, the Indian mystical system, where the left-hand snake is Ida, the feminine channel of the Moon and the right-hand snake is Pingala, the masculine channel of the Sun. Entwining the rod of Sushumna, the central channel of the spinal cord, they symbolise the pathway in the subtle body of the rhythmically ascending Kundalini power as she rises to the crown and illuminates the chakras, or hidden energy centres. Mercury, god of the crossroads, also governs transportation: how we get where we're going, both physically and mentally. Are you a hare, or a tortoise? Mercury's position in your chart will tell all... The god of travellers also has a role as a spiritual guide, in charge of transporting souls to the afterlife. Known as the psychopompos (soul-guide), Mercury as Hermes was believed to cross the boundaries between the worlds and convey the souls of the deceased to their home in the Underworld. This knowledge was transmitted to the Greeks and then to the Romans from the temple schools of Ancient Egypt. The Egyptian masters credited Thoth with the creation of magic and the invention of writing and the calendar. He was the divine record-keeper and mediator. 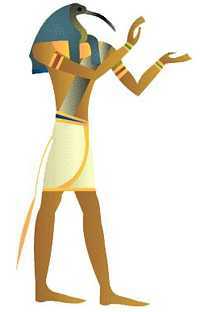 Thoth was the Egyptian Mercury. Astronomically, Mercury is the closest planet to the Sun and the smallest planet in the solar system—if we don't count Pluto, which has recently been demoted by astronomers to the status of "Dwarf Planet"... Mercury is relatively bright, but hard to see (except at a Solar Eclipse) because he never strays more than a little over 28° from the Sun. Taking just under 88 days to complete his journey through the twelve signs of the zodiac, the speedy Messenger spends less than three weeks on average in each of them, except when retrograde. Mercury turns retrograde three times a year as a rule, for around 24 days, remaining stationary for three days. Mercury is the traditional planetary ruler of Gemini (communication; intellect), his Day Sign, and Virgo (analysis; critical ability), his Night Sign. Mercury is exalted in Virgo, due to the ancient sacred geometry of the zodiac. People with these signs prominent in their charts are said to be ruled by Mercury. True to his busy character, Mercury enjoys mixed colours, along with blue and purple; his day is Wednesday (Woden was the germanic Mercury), his metal quicksilver, and his gem the emerald. Now check out Mercury Retrograde, for some insight into communication breakdown!